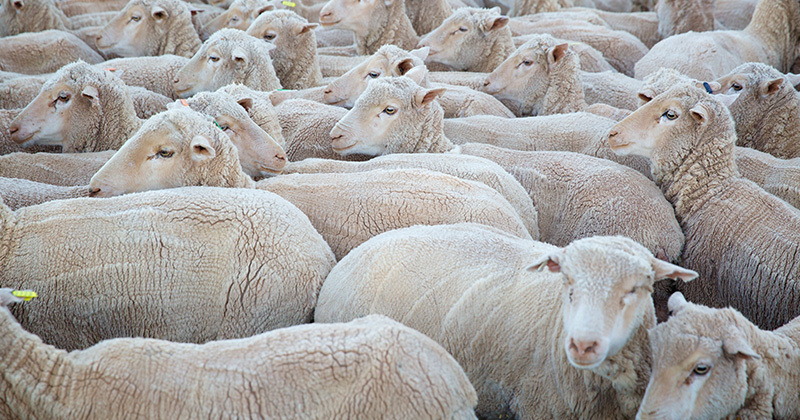 If we were to think of what “black swan” events might impact the wool market in 2019, Foot and Mouth Disease (FMD) outbreak in South Africa (SA) would not have been high on the list. This, however, has been the case as this week China decided to bypass SA wool auctions, leading to Cape Wools SA deciding to suspend wool sales this week. This decision was on the back of an outbreak of FMD identified in January in the Vhembe district in Limpopo. The Eastern Market Indicator (EMI) surged on opening in Melbourne on Monday, gaining 59 cents by the end of the week to 2,027 cents. The last time it settled above 2,000 cents was in October 2018. The Au$ was again slightly stronger up 0.57%. This resulted in the EMI in US$ terms was also dearer, up 50 cents to end the week at 1,451 US cents (Table 1). In Fremantle, the Western Market Indicator (WMI) was also pumped by the events across the Indian Ocean, rising 31 cents to end the week at 2161 cents. This is also the highest level since October 2018. 42,029 bales were offered for sale this week, with the trade clearing 39,447. Again, growers were impressed with the market and passed in only 6.1% or 2,582 bales. The dollar value for the week was $83.56 million, for a combined value of $2.14 billion so far this season. In the auction weeks since the winter recess, 975,539 bales have been cleared to the trade. All types benefited from the strong market, however later in the week there was evidence that buyers may have been over exuberant and markets retreated from the peaks of Wednesday. 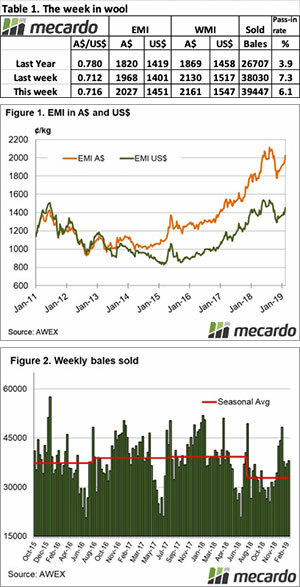 According to the AWEX roster, the next week 49,738 bales are predicted, with a designated Australian superfine sale in Sydney. This is a significant jump up from volumes rostered last week as strong prices are enticing sellers to come forward. 38,813 and 36,460 bales are rostered for the next two weeks. While it is disappointing for our wool producer friends in South Africa, the continued uncertainty around China’s intentions should see our market at least sustained at these levels in coming weeks.